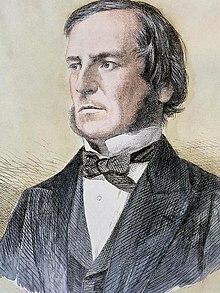 George Boole (2 November 1815 – 8 December 1864) was an English mathematician, logician and philosopher. As the inventor of Boolean logic, which is the basis of modern digital computer logic, he is regarded in hindsight as one of the founders of the field of computer science. George Boole, "Right Use of Leisure," cited in: James Hogg Titan Hogg's weekly instructor, (1847) p. 250 : Address on the Right Use of Leisure to the members of tho Lincoln Early Closing Association. The last subject to which I am desirous to direct your attention as to a means of self-improvement, is that of philanthropic exertion for the good of others. I allude here more particularly to the efforts which you may be able to make for the benefit of those whose social position is inferior to your own. It is my deliberate conviction, founded on long and anxious consideration of the subject, that not only might great positive good be effected by an association of earnest young men, working together under judicious arrangements for this common end, but that its reflected advantages would overpay the toil of effort, and more than indemnify the cost of personal sacrifice. And how wide a field is now open before you! It would be unjust to pass over unnoticed the shining examples of virtues, that are found among tho poor and indigent There are dwellings so consecrated by patience, by self-denial, by filial piety, that it is not in the power of any physical deprivation to render them otherwise than happy. But sometimes in close contiguity with these, what a deep contrast of guilt and woe! On the darker features of the prospect we would not dwell, and that they are less prominent here than in larger cities we would with gratitude acknowledge; but we cannot shut our eyes to their existence. We cannot put out of sight that improvidence that never looks beyond the present hour; that insensibility that deadens the heart to the claims of duty and affection; or that recklessness which in the pursuit of some short-lived gratification, sets all regard for consequences aside. Evils such as these, although they may present themselves in any class of society, and under every variety of circumstances, are undoubtedly fostered by that ignorance to which the condition of poverty is most exposed; and of which it has been truly said, that it is the night of the spirit,—and a night without moon and without stars. It is to associated efforts for its removal, and for the raising of the physical condition of its subjects, that philanthropy must henceforth direct her regards. And is not such an object great 1 Are not such efforts personally elevating and ennobling? Would that some part of the youthful energy of this present assembly might thus expend itself in labours of benevolence! Would that we could all feel the deep weight and truth of the Divine sentiment that " No man liveth to himself, and no man dieth to himself. In presenting this Work to public notice, I deem it not irrelevant to observe, that speculations similar to those which it records have, at different periods, occupied my thoughts. In the spring of the present year my attention was directed to the question then moved between Sir W. Hamilton and Professor De Morgan; and I was induced by the interest which it inspired, to resume the almost-forgotten thread of former inquiries. It appeared to me that, although Logic might be viewed with reference to the idea of quantity, it had also another and a deeper system of relations. If it was lawful to regard it from without, as connecting itself through the medium of Number with the intuitions of Space and Time, it was lawful also to regard it from within, as based upon facts of another order which have their abode in the constitution of the Mind. The results of this view, and of the inquiries which it suggested, are embodied in the following Treatise. A successful attempt to express logical propositions by symbols, the laws of whose combinations should be founded upon the laws of the mental processes which they represent, would, so far, be a step towards a philosophical language. Letter to William Thomson (2 January 1851), indicating his early work on what has since become known as Boolean logic. The scepticism of the ancient world left no department of human belief unassailed. It took its chief stand upon the conflicting nature of the impressions of the senses, but threw the dark shade of uncertainty over the most settled convictions of the mind; over men's belief in an external world, over their consciousness of their own existence. But this form of doubt was not destined to endure. Science, in removing the contradictions of sense, and establishing the consistent uniformity of natural law, took away the main pillars of its support. The spirit, however, and the mental habits of which it was the roduct, still survive; but not among the votaries of science. For I cannot but regard it as the same spirit which, with whatever profession of zeal, and for whatever ends of supposed piety or obedience, strives to subvertthe natural evidences of morals, - the existence of a Supreme Intelligent Cause. There is a scepticism which repudiates all belief; there is also a scepticism which seeks to escape from itself by a total abnegation of the understanding, and which, in the pride of its new-found security, would recklessly destroy every internal ground of humant trust and hope... Now to this, as to a former development of the sceptical spirit, Science stands in implied but real antagonism. The design of the following treatise is to investigate the fundamental laws of those operations of the mind by which reasoning is performed; to give expression to them in the symbolical language of a Calculus, and upon this foundation to establish the science of Logic and construct its method ; to make that method itself the basis of a general method for the application of the mathematical doctrine of Probabilities ; and, finally, to collect from the various elements of truth brought to view in the course of these inquiries some probable intimations concerning the nature and constitution of the human mind. That logic, as a science, is susceptible of very wide applications is admitted; but it is equally certain that its ultimate forms and processes are mathematical. The above interpretation has been introduced, not on account of its immediate value in the present system, but as an illustration of a significant fact in the philosophy of the intellectual powers, viz., that what has commonly been regarded as the fundamental axiom of metaphysics is but the consequence of a law of thought, mathematical in its form. Let us conceive, then, of an algebra in which the symbols x, y z etc. admit indifferently of the values 0 and 1, and of these values alone The laws, the axioms, and the processes, of such an Algebra will be identical in their whole extend with the laws, the axioms, and the processes of an Algebra of Logic. Difference of interpretation will alone divide them. Upon this principle the method of the following work is established. Let x represent an act of the mind by which we fix our regard upon that portion of time for which the proposition X is true ; and let this meaning be understood when it is asserted that x denote the time for which the proposition X is true. (. . .) We shall term x the representative symbol of the proposition X. "The probability of an event is the reason we have to believe that it has taken place, or that it will take place." "The measure of the probability of an event is the ratio of the number of cases favourable to that event, to the total number of cases favourable or contrary, and all equally possible" (equally like to happen). From these definitions it follows that the word probability, in its mathematical acceptation, has reference to the state of our knowledge of the circumstances under which an event may happen or fail. With the degree of information which we possess concerning the circumstances of an event, the reason we have to think that it will occur, or, to use a single term, our expectation of it, will vary. It has been said, that the principle involved in the above and in similar applications is that of the equal distribution of our knowledge, or rather of our ignorance the assigning to different states of things of which we know nothing, and upon the very ground that we know nothing, equal degrees of probability. I apprehend, however, that this is an arbitrary method of procedure. Instances may occur, and one such has been adduced, in which different hypotheses lead to the same final conclusion. The principles of the theory of probabilities [cannot] serve to guide us in the election of... [scientific] hypotheses. I have endeavoured, in the following treatise, to convey as complete an account of the present state of knowledge on the subject of Differential Equations, as was consistent with the idea of a work intended, primarily, for elementary instruction. It was my object, first of all, to meet the wants of those who had no previous acquaintance with the subject, but I also desired not quite to disappoint others who might seek for more v advanced information. These distinct, but not inconsistent - aims determined the plan of composition. I presume that few who have paid any attention to the history of the Mathematical Analysis, will doubt that it has been developed in a certain order, or that that order has been, to a great extent, necessary -- being determined, either by steps of logical deduction, or by the successive introduction of new ideas and conceptions, when the time for their evolution had arrived. p. v; cited in: Quotations by George Boole, MacTutor History of Mathematics, August 2010.
p. vi; cited in: Quotations by George Boole, MacTutor History of Mathematics, August 2010. Mathematics had never had more than a secondary interest for him ; and even logic he cared for chiefly as a means of clearing the ground of doctrines imagined to be proved, by showing that the evidence on which they were supposed to rest had no tendency to prove them. But he had been endeavouring to give a more active and positive help than this to the cause of what he deemed pure religion. That he was doing nothing in this way was a sore distress to him. My husband told me that when he was a lad of seventeen a thought struck him suddenly, which became the foundation of all his future discoveries. It was a flash of psychological insight into the conditions under which a mind most readily accumulates knowledge. George afterwards learned, to his great joy, that the same conception of the basis of Logic was held by Leibnitz, the contemporary of Newton. De Morgan, of course, understood the formula in its true sense; he was Boole's collaborator all along. Herbert Spencer, Jowett, and Leslie Ellis understood, I feel sure; and a few others, but nearly all the logicians and mathematicians ignored the statement that the book was meant to throw light on the nature of the human mind; and treated the formula entirely as a wonderful new method of reducing to logical order masses of evidence about external fact. We believe that to the great body of the reading public the name of George Boole first became known, if indeed it has yet become known, through the announcement of his death; the announcement being accompanied in a few of the papers by a brief sketch of his life and works. Boole's researches were not of a nature to be appreciated by the multitude, and he never condescended to those arts by which less gifted men have won for themselves while living a more splendid reputation. When a great politician dies, or any man who has filled a large space in the public mind, and made a noise in the world, the newspapers long ring with the event. But it is otherwise with the great thinker, the mathematician or the philosopher, who has laboured silently and in comparative seclusion, to extend the boundaries of human knowledge. When such a man is removed by death there are public journals, even among those professedly devoted to literature and science, which can dismiss the event with a few faint and cold remarks. * But time rectifies all that. It is found sooner or later that no reputation, however brilliant, is permanent or durable which does not rest on useful discoveries and real contributions to our knowledge. Boole literally transformed logic into a type of algebra (which came to be known as Boolean algebra) and extended the analysis of logic even to probabilistic reasoning. ...Boole managed to mathematically tame the logical connectives and, or, if...then, and not, which are currently at the very core of computer operations and various switching circuits. Consequently, he is regarded by many as one of the "prophets" who brought about the digital age. Still, due to its pioneering nature, Boole's algebra was not perfect. First, Boole made his writings somewhat ambiguous and difficult to comprehend by using a notation that was too close to that of ordinary algebra. Second, Boole confused the distinction between propositions (e.g., "Aristotle is mortal"), propositional functions or predicates (e.g., "x is mortal"), and quantified statements (e.g., for all x, x is mortal"). Finally, Frege and Russell were later to claim that algebra stems from logic. One could argue, therefore, that it made more sense to construct algebra on the basis of logic rather than the other way around. This page was last edited on 3 April 2019, at 16:35.